Please, Don’t Tell It – Show Me. Imran was frightened. He ran out of the room. But do you really get it? Can you empathise with the character. In two seconds we have gone from Imran being frightened to leaving the room. How frightened was he to make that snap decision to leave? We got to the point, fantastic, but was the reader drawn into the world? I – don’t – think – so. All we did was TELL the reader. In a movie scene (unless there is a narrator), we have to go by the actions on screen. We aren’t told that Imran is frightened, but we can see it on his face or his subtle mannerisms. Tell Version: Imran was frightened. He ran out of the room. Show Version: Imran’s breathing was less controlled. The room, appeared small, almost caving in around him. He stumbled backward giving the wall the lightest touch with trembling fingers. He gulped at the cobweb that dangled from the ceiling; no spiders lurked, or not ones that he could see. Goose bumps tore down his arms. Imran couldn’t take any more. He didn’t have to be in this room. Without second thought he darted for the door. Everything wobbled into a blur before he fell onto the creaking floorboards. Gasping for breath, head clutched, he glimpsed into the room. My version can no doubt be bettered by others, but I hope it opens up the original sentence into a cauldron of emotions. By stating his breathing, his fear of spiders, and the pitiful state he conveys by clutching his head, we’ve expanded the word ‘frightened’. In fact, the word ‘frightened’ is not present anymore. He has to overcome the fear no matter what. Telling is not forbidden. It can be used, but if you see an opportunity to make the reader see the sweat rather than state it, go for it. I believe that ‘showing’ is a case of engaging all the senses. How does fear taste? Smell? What does the world look like when you are scared? Absolutely. I often imagine myself in a situation, wondering about the taste and smell. Sometimes it comes to me without much thought, and on others… I have to watch movies, ask others to get that moment. Telling is something I find easier to spot in other peoples work than my own, a case of being ‘too close’ I think. There is truth in spotting it in others than our own. Maybe I should start a post one day where people stae the worst kinds of telling the have found. Of course, they would have to (like you’ve said) be sure that it wasn’t a perfect execution of telling. I agree. Obviously there are times when ‘telling’ is the best choice, but what you’ve demonstrated fabulously here is that by ‘showing’ something the reader is able to engage with the character at a deeper level and feel their emotions rather than merely being a distant observer. Of course … There can always be the bad side too. I have read some novels where the showing is ‘so’ showing that purple prose leaks in like it’s a sponsored colour of the novel. Even I have to remind myself of SNT. On many occasions I think I have it.. And then on the redraft, I cringe at the most telling sentences ever. Great post Imran, I must have missed this one first time around. Yes, important to show, and as several people have mentioned, show concisely! A more drawn out version of telling can aid suspense – or comedy – but otherwise can bog down the story. For fast pacing, you need the fast tell. The feel of the room was all wrong. Imran’s stomach clenched. Suddenly he knew – he couldn’t stay there. Something very, very bad was about to happen. How had he ended up here? Imran had no idea. The walls of the room bellied inwards, squeezing, coming closer all the time. They would crush him – if the spiders didn’t get him first! 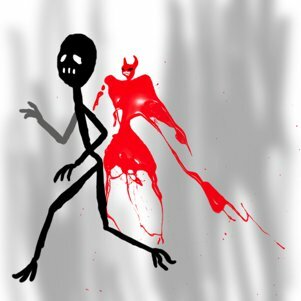 Acid dripped from their mandibles, their legs rasped on the wall as they came for him. Closer came the jaws, the trembling hair of their bodies – he leapt for the door and yanked at the handle, hauling with all his might and praying it wasn’t locked. Outside stood his mum, stirring a cup of tea. She looked quite startled. He glanced back into the room – and it was safe again. His bedroom, filled with nothing worse than the stench of three-week old socks.